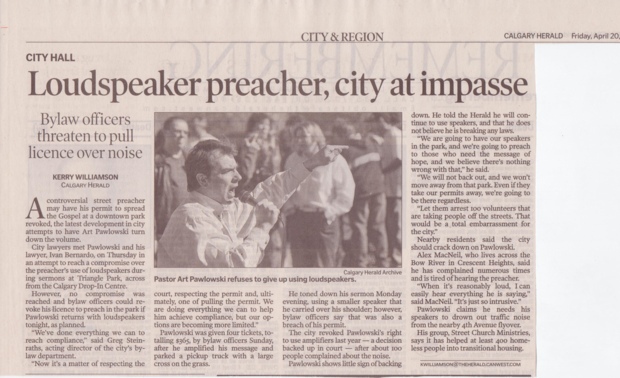 A controversial street preacher may have his permit to spread the Gospel at a downtown park revoked, the latest development in city attempts to have Art Pawlowski turn down the volume. 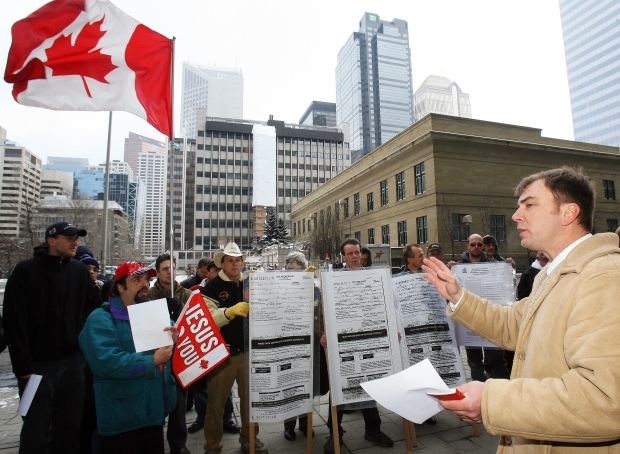 City lawyers met Pawlowski and his lawyer, Ivan Bernardo, on Thursday in an attempt to reach a compromise over the preacher’s use ofloudspeakers dur-ing sermons at Triangle Park, across from the Calgary Drop-In Centre. However, no compromise was reached and bylaw officers could re-voke his licence to preach in the park if Pawlowski returns with loudspeakers tonight, as planned. "We’ve done everything we can to reach compliance," said Greg Stein-raths, acting director of the city’s by¬law department. "Now it’s a matter of respecting the court, respecting the permit and, ulti-mately, one of pulling the permit. We are doing everything we can to help him achieve compliance, but our op¬tions are becoming more limited." 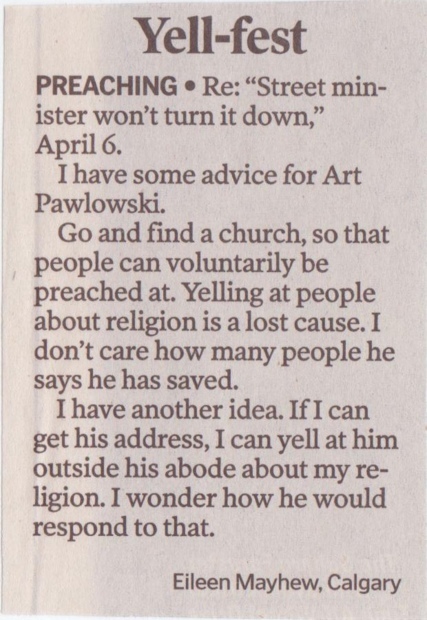 Pawlowski was given four tickets, to-talling $365, by bylaw officers Sunday, after he amplified his message and parked a pickup truck with a large cross on the grass. He toned down his sermon Monday evening, using a smaller speaker that he carried over his shoulder; however, bylaw officers say that was also a breach of his permit. The city revoked Pawlowski’s right to use amplifiers last year – a decision backed up in court – after about 100 people complained about the noise. Pawlowski claims he needs his speakers to drown out traffic noise from the nearby 4th Avenue flyover. His group, Street Church Ministries, says it has helped at least 400 home¬less people into transitional housing.